The Redbone Coonhound descends from Foxhounds that were brought to the United States, primarily Tennessee and Georgia, by Scottish and Irish immigrants in the late 1700 and 1800s. The Redbone’s lineage also includes Bloodhounds and Ancient Irish Hounds. Back in the 1800s, while other coonhound breeders were selecting only for function, a small group of breeders began concentrating on developing a “good-looking” hunting dog that was faster, more agile and had a heightened sense of smell. Importantly, the breeders also bred for aesthetics, particularly an eye-catching, solid, bright red coat not found in other coonhounds at the time. The first dogs resulting from this early breeding were commonly called “saddlebacks” due to a black saddle marking that appeared on their backs. Through selective breeding, the black saddle was bred out and the solid red dogs began to take prominence, becoming known as Redbone Coonhounds. It is unclear if the breed’s name came from one of the original breeders, Peter Redbone, or from the word, “redbone” which at the time was used to describe any red dog that was great at hunting and treeing. In 1840, George F.L. Birdsong provided the foundation stock of today’s Redbones and nearly all Redbone pedigrees can be traced back to this stock. Literature fans may remember this breed from Wilson Rawls’ 1961 classic novel “Where the Red Fern Grows,” a story about Billy and his relationship with his two Redbone Coonhounds, “Old Dan” and “Little Ann”. The book was made into a popular movie in 1974 and remade in 2003. The Redbone Coonhound was the second coonhound to be registered in the United Kennel Club in 1902, behind the Black and Tan Coonhound. Until recently, the dog was only known for hunting now owners are beginning to show their Redbone Coonhounds in competitions and their popularity is growing. The muscular Redbone Coonhound is tall, reaching a height of 27 inches at its withers (or shoulders) and has an air of confidence due to its well versed hunting talents. It has large webbed feet ideally suited for swimming, which it enjoys tremendously. Its dark brown to hazel eyes are full of expression, often pleading for attention which is so commonly seen among those adorable hound faces. The Redbone’s short coat is a rich, solid red though small white patches can sometimes be found on its chest and toes, which is attributed to its Bloodhound heritage. Often its muzzle is darker than the rest of its coat and it has long droopy ears and a long tail. 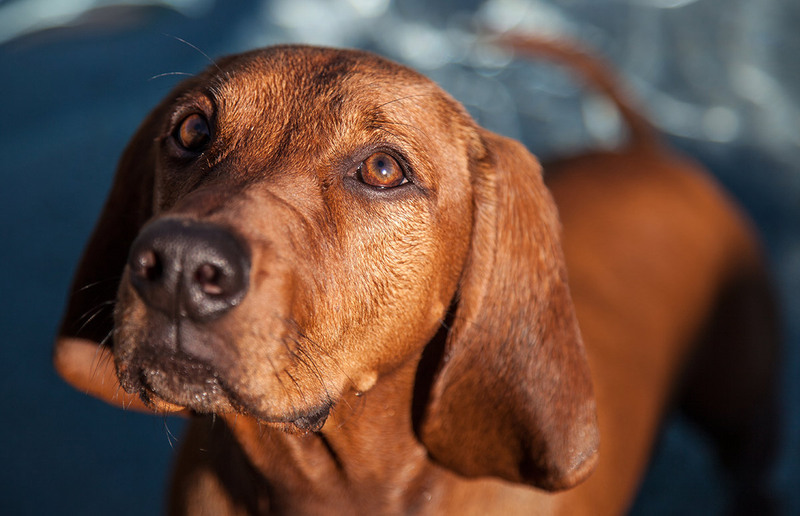 The Redbone Coonhound is a mellow, even-tempered, loyal and friendly pet though an aggressive hunter. Its desire to please makes it a good family dog that is amenable to formal training with diligence and patience from its owner. As its history outlines, the Redbone is an adaptable worker able to hunt and swim over a variety of terrains, from swamplands to mountains, with speed and agility. Its natural scenting and treeing instinct allows it to effectively track game ranging from raccoons to bears, cougars, and bobcats. With a good nose, this breed is an excellent choice for hunters who are looking for an honest, versatile and capable tracker. Good with children? Yes, especially children who like to play with this affectionate and active dog. At times, its playfulness can be overwhelming to a small child. Good with other dogs? Yes, though best when raised together from puppyhood. Good with cats? Possibly, if it has grown up with the cat from the time the dog was little. If it has not, it may consider the cat as prey and chase it. Good watch dog? Due to its heightened hunting senses and loud bark the Redbone makes a good watchdog. Easy to train? While it aims to please its owner, the Redbone’s treeing instinct may distract it as it attempts to tree small animals when given the chance. Often when it is in pursuit of such an animal, it may not even respond to its owner’s voice. As with any breed, it is best to socialize and begin training the dog as a puppy. Can be left alone? A Redbone is most happy when it is with its family; however it can entertain itself for hours and is a very independent thinker. It is persistent and will spend a lot of time attempting to solve a problem, not giving up easily, such as getting out of an enclosed area. Barker? While it has a pleasant sounding bark, the bark can turn into a howl when left alone, mostly indoors. When left outdoors, the Redbone tends to find things to do that keeps it from barking.